View More In Step Machines - Page 2. Climb your way to fitness! This amazing fitness climbing machine gets results by using your body weight to burn calories, build strength and sculpt muscles. Grab the stationary handles and focus on legs, or use the adjustable handles to get the full body effect. For an all inclusive full body workout, the Rxlife Vertical Climber is the only exercise equipment you need in your home gym. Burn more calories: Climbing machine is designed for high intense and full body workout. Users can exercise biceps, triceps, core and leg muscle at the same time. With climbing workout, users can burn more calories than treadmill in the same amount of time. Easy storage and space saving: Users can easily fold up the machine and put in the corner when not in use. 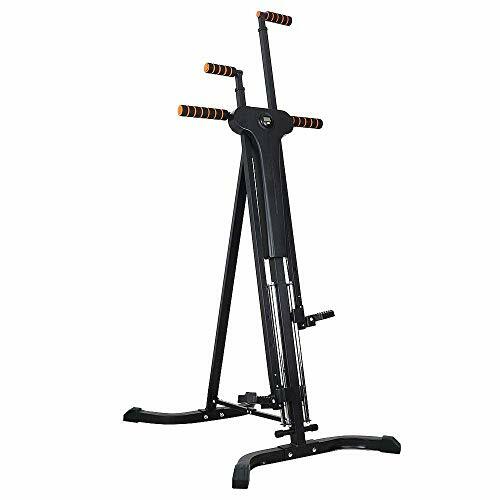 Durable Construction: The design of the durable square steel tube makes the climbing machine steady and ensure the stability of the exercise process. Safety Performance: The pedal of the climbing machine is anti-skid, which can effectively prevent you from slipping out in the course of movement, ensure the safety of use. Height Adjust from 62.4" to 74.8"
✔️ Full-body Workout: Combine Aerobic & Anaerobic exercises, natural climbing exercise. Mass＆shape muscles, improve your balance and strength. Burning fat and calories,what's more, full of fun. ✔️ LCD Smart Monitor:LCD monitor will record and save all your workout data like workout time, speed, calories and fat burns. ✔️ Fits For All Body Types: 5 levels strength adjustable that suit for all body types. You can adjust it based on your own situation. ✔️Safety : The machine pedal is anti-skid, machine mainly made of high strength metal, all ensure the safety of use. ✔️ Durable & Folding Design: Mainly made of high strength metal.Easy to storage and space saving. Easy to set up, lightweight and height adjustable. If you have any questions about this product by Rxlife, contact us by completing and submitting the form below. If you are looking for a specif part number, please include it with your message.